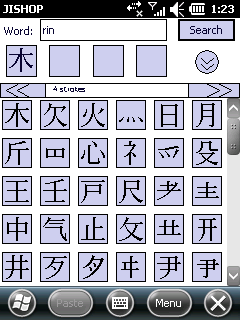 JiShop Mobile is a Japanese-English kanji and compound word dictionary for Windows Mobile-based devices. 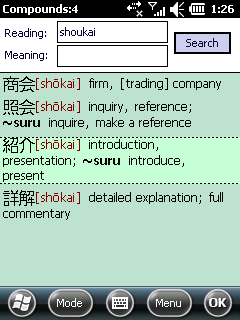 As a port of JiShop/Windows, it employs the same dictionary database and shares a good deal of functionality. Last update: November 28, 2011. 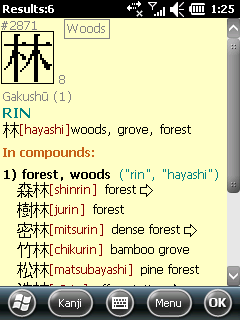 Release 3.50. 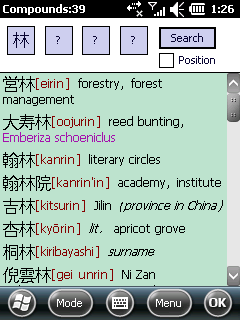 The database of JiShop Mobile is identical to that of JiShop/Windows. There is no automatic database update functionality yet. JiShop Mobile is licensed as shareware - you can use it for free for 30 days, then you have to purchase a permanent license. When a new version is released, the trial period is extended by 7 days.